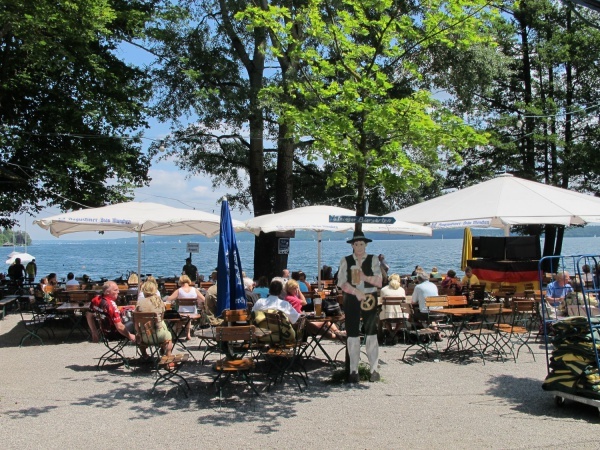 The Tutzinger beer garden is located directly at the shoreline of Starnberger See, approximately 37 kilometres south of central Munich. The beer garden, which attracts day visitors from Munich as well as locals from the area, is a welcoming alternative to the posh restaurant next door. Tutzinger is also the only real beer bargen at Starnberger Lake where visitors may bring their own food. The beer garden has a variety of traditional beer garden benches, round tables as well as regular tables are situated in the shade of large trees and sun umbrellas. Warm cosy sheets are provided to guests as protection from the often strong winds. The beer garden decoration is a bit kitschy. An old English phone box filled with books serves as a book exchange. The walls of the food stall are covered with photos of celebrities who have visited the beer garden. The beer served is Augustiner and a Maß costs €6.10 (June 2013). The food stall offers a good quality homemade food, such as soup of the day, Schweinebraten (roast pork), Obatzda (Bavarian cheese specialty), Hendl (grilled chicken) and cakes. A separate stall prepares Steckerlfisch (grilled fish on a stick). Tutzinger beer garden is a good place to relax and watch sailing boats gliding on the sea. Just next to the beer garden is the Surf & Segel Center Tutzing, a surfing and sailing school. Depending on the weather, the beer garden is open daily.